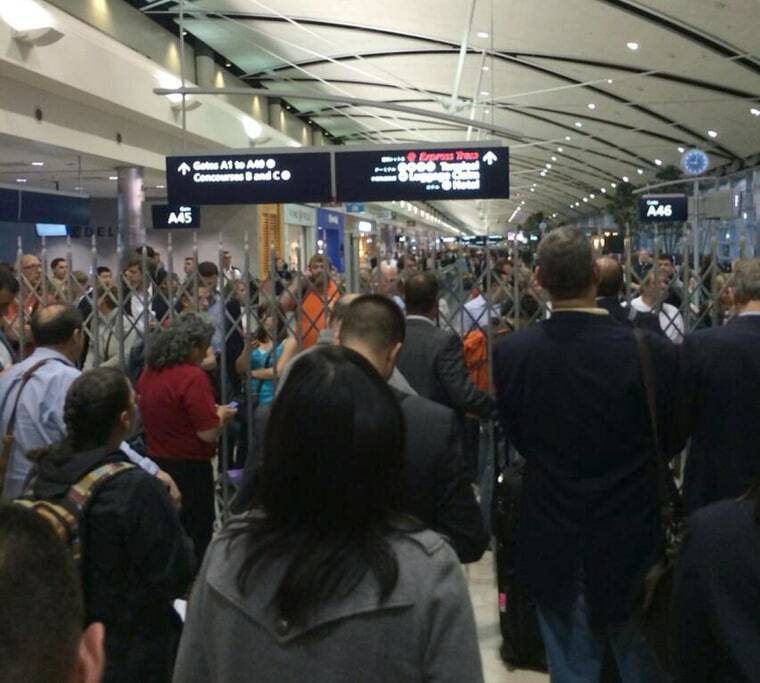 A two-hour security lockdown disrupted thousands of travelers at Detroit Metropolitan Airport late Thursday after a passenger entered a secure zone without submitting to a security check. The connecting passenger was already on the 'sterile' side of the departures zone when he went through an exit lane and decided to turn back into the secured area without re-clearing security, airport officials said. That sparked a lockdown in the main McNamara terminal while security officials tried to locate the man, delaying thousands of passengers. Metal shutters were drawn across the affected zones of the airport, separating passengers from the search activity, and sniffer dogs were used to sweep the terminal. The incident happened at 8.45pm local time (9.45 p.m. ET) Thursday and the lockdown was fully lifted shortly before 11 p.m. (midnight ET). Transportation Security Agency spokesman Ross Feinstein told the Detroit Free Press that the man ignored the instructions of a TSA agent and forced his way back into the terminal secure zone. The man was still in custody late Thursday, he said. The man arrived “from Little Rock and allegedly missed his connection to Los Angeles,” he told the newspaper. Brian Lassaline, a spokesman for Detroit Airport, said: "A passenger already on the secured side of the airport went through an exit lane, and decided to turn back into the secured area without going through security. “Airport officials have the passenger in custody and are questioning them, holding off on opening screening until the investigation is complete"
One passenger, James Geiger, told the Detroit Free Press that his flight from Phoenix landed around 8:55 p.m. and he said everyone was placed under a lockdown shortly after that.